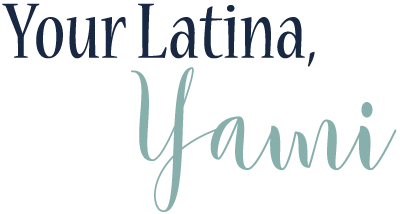 Shirley~Intelligent Domestications • Alli~An Alli Event • Michelle~Our Crafty Mom Marie~DIY Adulation • Erlene~My Pinterventures • Beverly~Across The Blvd. Hello there! 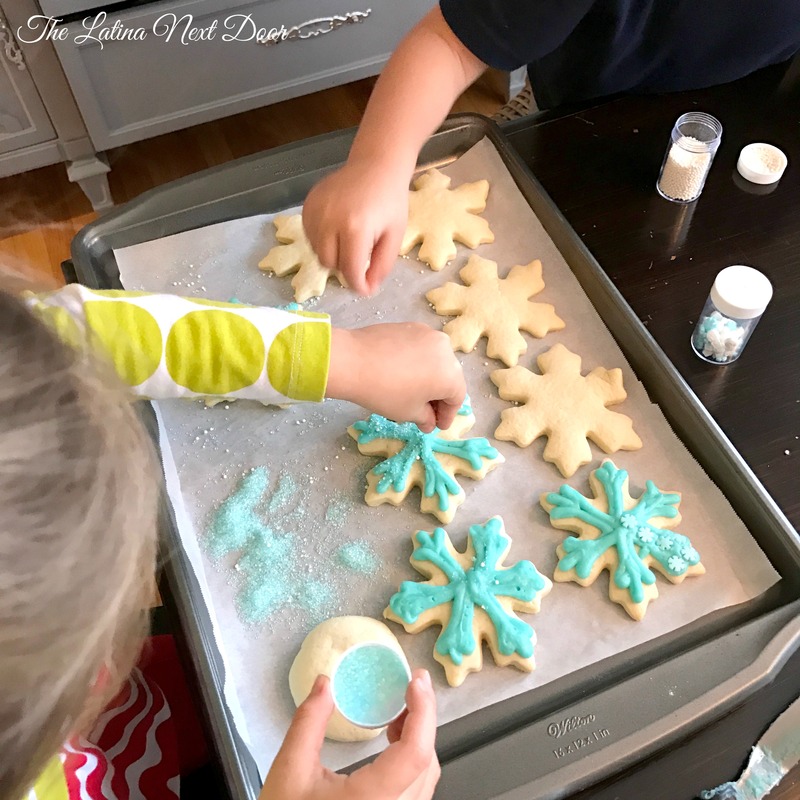 I hope you are getting into the Christmas spirit because today we are talking all things Christmas cookies! 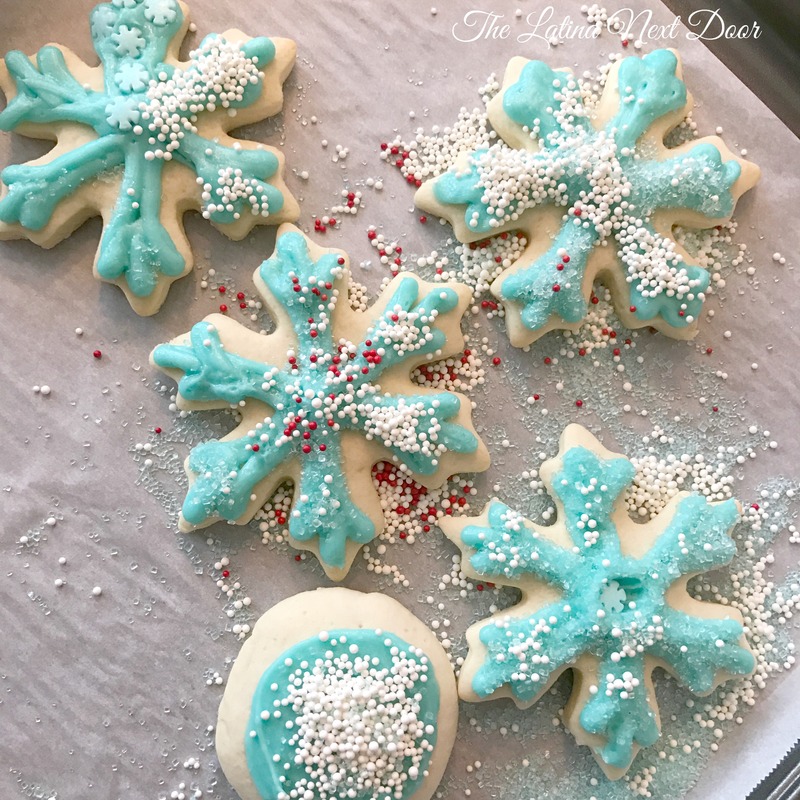 Now that you know how to make the best dish for those holiday get-togethers and that special adult beverage for those of you who don’t like eggnog, it’s time to get out those cookie cutters cause I am going to share a cookie recipe you will love! My kids’ teachers love them! 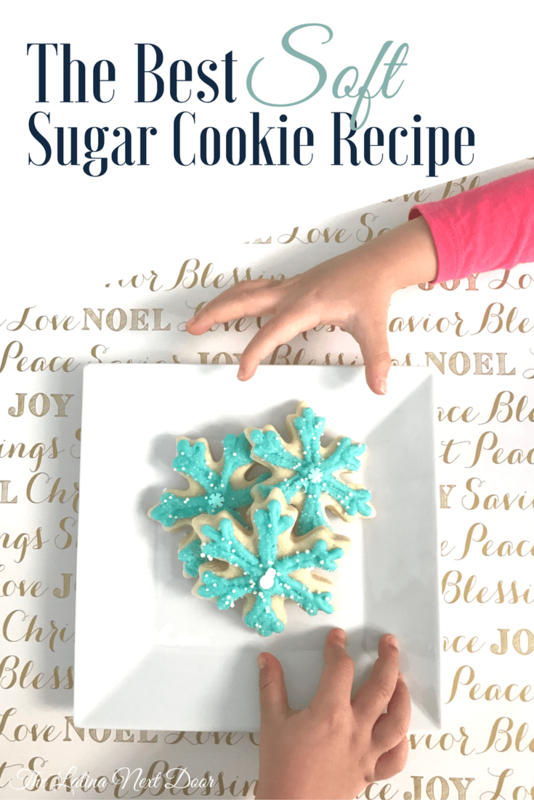 It took me a few attempts but I finally found the best soft sugar cookie recipe on Pinterest… and then I tweaked it just a bit to fit my own taste, cause that’s how we do here! 1. Mix together margarine & sugar. Beat until it is creamy. Add the eggs, vanilla, almond extract and sour cream and mix it all with a mixer until combined. 2. In a separate bowl mix the flour, baking soda, baking powder and salt. Then slowly add the dry ingredients to the wet ingredients in the mixer as it is blending. Mix it just until everything is combined. 3. Separate the dough in two equal parts, cover with saran wrap. Refrigerate the dough for a couple of hours. 4. Once the dough is fully chilled roll out dough on a bakers mat, parchment paper or even your counter. The dough will be sticky so be prepared to add anywhere from 1/4 cup to 1/2 cup more of flour. 5. Cut with your desired cookie cutter, I used this snowflake one. Make sure the cookie cutter is either dusted with flour or powdered sugar to prevent it from sticking to the dough. 6. Bake at 350 degrees for 8-9 minutes. And presto! 1. Combine all listed ingredients and mix with an electric mixer until smooth. Make sure the butter is at room temperature and make sure you do not stick it in the microwave to soften or it will separate your frosting. Then frost on cooled cookies and serve right away or save for later! I enjoy making these with the kids. They get so excited and love to decorate them. These cookies are the perfect combination of a sugar cookie and a cake. Perfect taste and texture… They turned out so well! You have no idea how many times I have baked these for school. They are a hit among the kids (and the teachers as well). This recipe actually yielded me around 45 cookies. If it wasn’t because I was making them for my daughter’s class I would have saved half the batter and stored it in the freezer. It freezes and defrosts great. What kind of cookies do you bake this season? If you try these you gotta let me know how they turn out! The cookie cutter I used is below! Be sure to visit our fellow 12 Days of Christmas Bloggers below for even more creative ornament ideas this holiday season! Filed Under: Food... Buen Provecho!, For the Holidays! Sugar cookies are my favorite! We make sugar cookies for all the holidays and I love cookies cutters. My kids love to make them. Yes! They are so fun to make. I love getting the kids involved – they truly love decorating them and we have a blast. Your kids are such artists! Sugar cookies are such a wonderful classic Christmas cookie, aren’t they? These look beautiful? Did you use butter or margarine when you made them? You put either on the recipe ingredient list, but butter and margarine can make a difference between soft or crispy cookies.